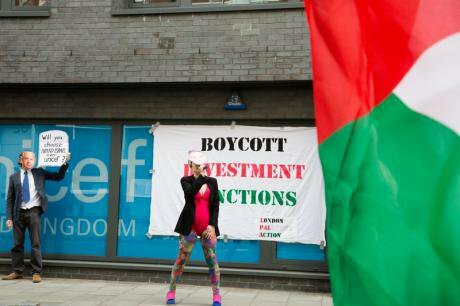 BDS activists protest outside UNICEF-UK, April 2015. Demotix/Mark Kerrison. All rights reserved.History has shown us that lasting positive change does not happen on its own. It requires those seeking to improve their position in society, and others standing in solidarity with them, to form a cohesive and informed critical mass that can transform their struggles into a substantive change in conditions. With this in mind, it is necessary to ‘audit’ the threats and opportunities to the growth of political consciousness and structural power in civil society: where are popular struggles positioned in relation to the political establishment? What potential constraints are there to those struggles being realised? To engage with these questions, we should recognise that the very forces we seek to challenge through critical thinking and action – capitalism, militarism, racism, patriarchy and so on – reproduce themselves by producing policies and discourses that actively limit the potential for resistance. We can see this in a range of recent policy initiatives, loosely justified under the banner of safeguarding national security. Through their prospective impacts on NGOs, universities and broader civil society, these policies pose a serious threat to the growth of critical thought and action in the UK, and thus to the potential for structural change. “Vocal or active opposition”: an extremist act? The ‘Counter Terror and Extremism Bill’, brought eagerly into force by the Conservatives just weeks after the recent election, has numerous worrying implications. As well as receiving criticism over the draconian immigration policing methods it describes, the Bill has enshrined the government’s “Prevent” strategy into law. Prevent is a government initiative that has been rolled out over the past five years under the guise of curtailing the formation of violent terrorist networks. Projecting the ‘war on terror’ into UK classrooms and community centres, Prevent seeks to position public sector workers as proxy security forces charged with stamping out extremism. It is through the use of the nebulous term “extremism”, which remains undefined in the Bill itself, that the oppressive policy logic of the Prevent strategy is grounded. Extremism is identified vaguely in the original Prevent guidance as “vocal or active opposition to fundamental British values including democracy, the rule of law, individual liberty and mutual respect and tolerance of different faiths and beliefs”. Building on this troubling definition, the guidance goes on to propagate that extremism is not always violent, and not always illegal. In fact, the crux of its argument is that non-violent and legal extremism is what needs to be tackled first and foremost. In fact, the crux of its argument is that non-violent and legal extremism is what needs to be tackled first and foremost. This assertion then provides the rationale for those employed in the education and community sectors to act as an arm of government surveillance. Under the Bill, those working in schools and universities have a duty to “create an environment where extremism cannot operate” and as such to report any students suspected to be “at risk”, with the threat of legal penalties for individual employees if they cannot prove that they are taking steps to do this. There has been much written elsewhere about the institutionalised racism this policy facilitates. The Prevent guidance is Islamaphobic in its nature; explicitly identifying aspects of Islamic identity as precursors for extremism to be stacked against other “criteria”. This creates a situation where, for example, university staff could feel legally obliged to report Muslim students who are critical of UK foreign policy, but to ignore non-Muslim students with the same views. University staff could feel legally obliged to report Muslim students who are critical of UK foreign policy, but to ignore non-Muslim students with the same views. The racialised nature of the Bill and its high potential to cause individual trauma are the primary reasons to oppose it. As a recent example of Prevent’s deployment at Staffordshire University shows, it seems we should not expect any substantive recognition from the government of how harmful this policy could be to student's welfare. But the potential impacts of the legislation go even further. In a chilling passage, the Prevent guidance states that “Muslims facing apparent or real social discrimination and socio-economic disadvantage” find “just cause” in terrorism. This suggestion is presented as the basis for the assertion that “radicalisation occurs as people search for identity, meaning and community”. It is in expressions like this that we see how the policy moves to generalise its logic of surveillance, beyond just racial terms. Blurring into the language of ‘domestic extremism’, the Bill gives quasi-legal basis to the targeting of any groups engaging in thought or action that could be conceived as challenging state power, whether their actions are classed as illegal or not. As Prevent narrows the space for critical thought in universities, closely linked initiatives threaten to restrict the behaviour of NGOs. Most UK NGOs are legally registered as charities and, as such, there are legal restrictions on the extent to which they can campaign or behave “politically”. This goes back to the idea of charities existing for “public benefit” and the legitimate concern that a charity could exist simply as a mouthpiece for a political party. Regulation of charitable activities is carried out by the Charity Commission, which broadly speaking, has always been relatively benign, and has only stepped in to police clear cases of organisational malpractice. Recently though, there has been a growing feeling that the Commission is becoming more aggressive, and that its ties to the Conservative party's policy agenda are strengthening. In the run up to the general election, the Lobbying Act – nicknamed by many the gagging law – was brought in as additional temporary regulation, presented as necessary to ensure that charities could not exert undue influence on election issues. The act has been unpopular with charities themselves from its inception, and a recent report by the Harries Commission on Civil Society and Democratic Engagement concluded that “a significant proportion of charities and campaign groups stepped back from campaigning on issues of public concern” as a result of it. Having personally attended the evidence gathering session for the Harries report, I heard first-hand about the disproportionate impacts the act has had. Examples include an NGO drawn into months of costly legal dispute over a single social media post; numerous groups erroneously scared off joining a coalition against corporate tax avoidance; and harsh restrictions put on supporter-led, community campaigning activities. As well as the immediate impacts on individual NGOs, these restrictions have a longer-term “chilling effect” on how the charity sector feels it can work, the issues it can work on, and the extent that wider society can feel actively involved. Following the lobbying act, it has been suggested that the article in charity law that deals with campaigning, known as CC9, is to be reviewed by the Charity Commission in the coming months. Although not captured in the Harries Report, there was a clear feeling of unease from many senior campaigners and charity professionals present at the evidence gathering session. Many believe that, having flexed its muscles during the lobbying act, the Commission is gearing up towards making such restrictions on campaigning permanent. Additionally, new laws have already come into force meaning that the Commission can act very quickly to close down or re-route funds of any charities that they suspect are “linked to extremism”. Though, the robustness of this legislation and public trust that it will be exercised responsibly, have been drawn into question during the recent legal case between the Charity Commission and controversial human rights group CAGE. As much as the Charity Commission attempts to claim neutrality from government, there are clear connections being forged and interests being serviced. William Shawcross, head of the Charity Commission, has publicly expressed his outrage at Europe’s “growing Islamic populations” and is an outspoken proponent of the UK’s presence in Iraq. True to his self-proclaimed “neo-conservative” form, Shawcross seems to want a charity sector based on service provision only to compliment Cameron’s big society: a sector where charities are seen but not heard. Most strikingly, Shawcross recently appeared on the panel list for a conference hosted by the Israeli military titled “Boycott, divestment and sanctions: a strategic threat”, but was removed after it received negative attention on Twitter. We need to ask questions about how we got here. If those in regulatory bodies now seek to define a boycott as an existential act, what is next on the list? Maintenance of the UK government’s close military relationship with Israel seems to be increasingly shoehorned into the package of political actions justified through the rhetoric of national security. As these insidious relationships are projected on the world stage as necessity, grassroots opposition is being crushed through policies like Prevent and NGOs kept at bay through the Charity Commission’s bullying. Indeed, under Prevent we have already seen a teenager branded an extremist for expressing pro-Palestinian views and, as LSE professor Jonathan Rosenhead wrote recently, Palestine action groups looking to meet on university campuses have long been subjected to harsh restrictions and monitoring. In the latest move of this kind, the Tories recently unveiled plans to restrict the power of local councils to divest from Israel or the arms trade. Through the insidious rhetoric of “extremism” and “protecting British values” these various threads of legislation bring with them something bigger than the sum of their parts. They represent a soft power that gives increasing legitimacy to a climate of surveillance and stigmatization. They represent a soft power that gives increasing legitimacy to a climate of surveillance and stigmatization across whichever strains of thought and action can be spun as a “national threat”. There has been a snowball effect, stemming from the practices often referred to collectively as the “the war on terror”, morphing from their original articulation as a projection of hard power overseas, through to an internalisation of the threat of terrorism that projects its same imperialist logic into the domestic sphere. This has produced a powerful security discourse that is being continually redefined in order to crush broader challenges to state hegemony. Taken in isolation, these policy initiatives have clear and quantifiable potential to limit structural change on a range of issues. Located holistically, the implications stretch further, illuminating a political discourse that seeks to criminalise dissent and redefine how our democracy works. In a society where students can be criminalised for their political views; the silencing of critical NGOs is justified as necessary to protect elections from civil society's influence; and the boycotting of arms companies is constructed as tantamount to terrorism, we need to ask questions about how we got here. Beyond a response that challenges these policies themselves, there is a need to unpack the narratives that have given rise to them and to call in question how, as a society, we allow our security and democracy to be defined.